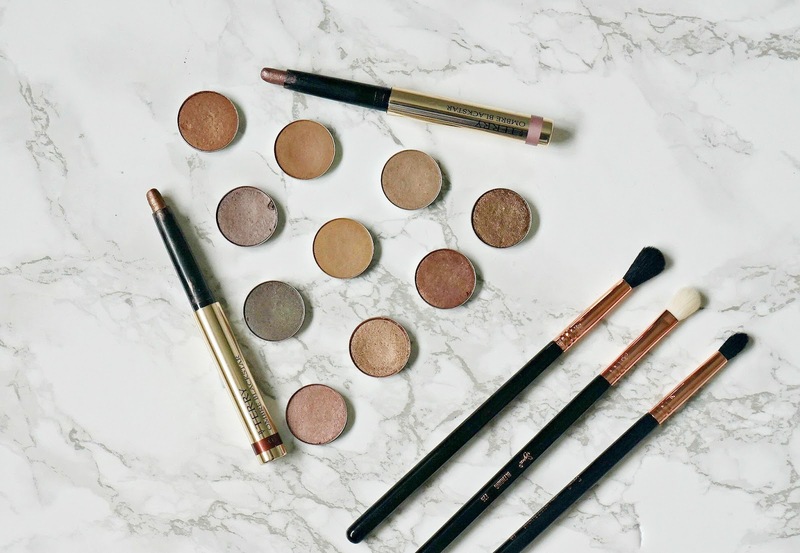 We all know that I'm an eyeshadow addict but there are days when blending 3 eyeshadows just seems like too much hard work and too time consuming - that's where one sweep shadows come in handy. Today I am sharing my favourite one sweep shadows with you - most of them are MAC shadows but there are also two shadow sticks, which are the ultimate for lazy eye days. From the photo above, you can see that I have a type - just like I told you in my blush post (here) and I think that makes it easier on mornings when I am indecisive at best - lazy at worst! I find that copper, gold and bronze tones suit my green eyes best and I will always reach for one of these shadows. The top eyeshadow is MAC Bronze, which is a frost shadow. This is a very pigmented shadow so a light hand and just one sweep is necessary. A beautiful warm brown/bronze shade that is easy to work with. Next is MAC Satin Taupe, which is another frost shadow. Again, it is very easy to work with due to it's texture (I love MAC shadows in general - well apart from the mattes that aren't great, but I find MAC shadows easy to apply and blend) and it is also nicely pigmented. This shade works so well as a one sweep eyeshadow because it has a variety colours going on - it is a grey/purple/brown/taupe and looks great with just a slick of liner and mascara. Definitely one of my all time favourite MAC shadows. Next is MAC Cork, which is a warm brown with a matte finish. This is one of MAC's better matte shadows as it isn't chalky in texture. It's the perfect transition shade but I love to wear it on it's own as the warm brown shade works well with my green eyes. Next is MAC Club, which I love because it has an almost duo-chrome effect with a pearl finish. It looks brown, green and grey and just works well with my green eyes but I think it would work well with most eye colours because it has hints of a few colours in it. It also looks like you've made an effort with your eyeshadow when you really haven't! Next is MAC Soba, which is a satin eyeshadow. This warm, soft brown eyeshadow has a hint of gold is very under-rated because it does't look special in the pan but on the eye, it really adds some gentle definition. Next is MAC Patina, is a warm gold frost eyeshadow that also has a hint of grey/purple - it's like satin taupe mixed with gold and like Club, looks as though you have made a real effort with your eyeshadow even when you haven't. Another under-rated MAC shadow. The top two shadows are By Terry Ombre Blackstars. I am not the biggest fan of cream shadows because I have oily eyelids and find that they usually crease badly on me but when I wear these over Nars Pro Prime Smudge Proof Eyeshadow Base (best eye primer ever but just don't order directly from Nars because they have the worst customer service ever! ), these shadow sticks don't budge. 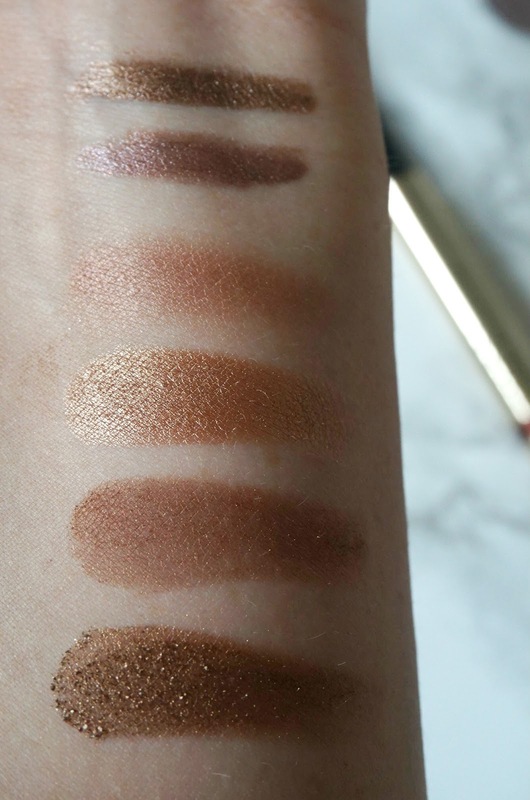 Bronze Moon is the top swatch, which is a deep bronze with a brown base and the second swatch is Misty Rock - a mauvey taupe. Both of these shadow sticks are very pigmented and are so easy to apply, but you need to work fast when blending as they set quickly. Back to MAC shadows and next is Sable, which is a soft, pink-bronze in a frost finish. This has a smooth texture, is pigmented and is perfect for a quick wash of colour. MAC Woodwinked is a Velux Pearl shadow that is a brown/bronze/gold shade. It is probably one of MAC's most famous shadows and with good reason - it is pigmented and has a beautiful texture with a metallic but not glittery finish. This is a long time favourite. Next is MAC Mulch, which is another warm red-brown with a slight gold running through it. I love the shimmer but it doesn't have a glitter and it is intensely pigmeted and again, has a soft texture which makes it so easy to apply and blend quickly. The final shadow is MAC Tempting, which is a warm, brown-gold with a frost finish. It isn't quite as smooth as Mulch but is still very easy to work with and because it is so pigmented, a light hand is needed for a quick wash of colour. 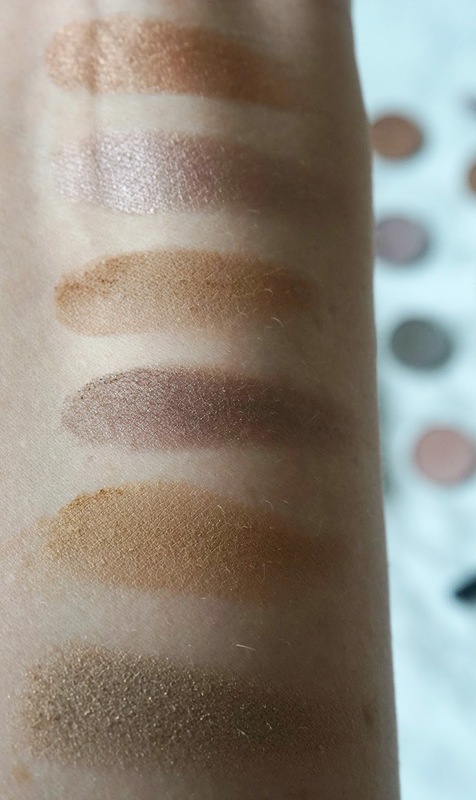 Do you wear any of these shadows? What is your favourite one sweep shadows? Of course, if I am feeling extra lazy, I just use my bronzer for the ultimate lazy day makeup!